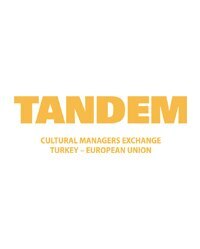 TANDEM – Cultural Managers Exchange Turkey – European Union aims at establishing long-term partnerships between cultural organisations from Turkey and the EU countries. Following the steps of the first TANDEM Turkey-EU round, conducted in 2011-2012, it is targeted at engaging participants in an intense international collaboration process, which includes the realisation of a shared interdisciplinary project, linked to their cultural expertise. TANDEM is an initiative of the European Cultural Foundation (Amsterdam), MitOst (Berlin), Anadolu Kültür (Istanbul), and supported by Stiftung Mercator (Essen). For one year, 15 cultural managers/project coordinators from Turkey and 15 from different EU countries form 15 transnational collaboration Tandems. All participants spend a placement at their partner’s organisation. Next to experiencing a new cultural environment, this working visit includes the planning and implementation of a shared cultural project or co-production. In addition to these exchange visits, the entire group meets several times to share their experience and knowledge of international collaboration and cross-cultural management. Throughout the process, participants receive know-how support from the programme organisers as well as project funding for their co-production/joint project. We believe in the importance of cultural collaboration to create lasting connections between dif-ferent groups and communities. Working with new organisations and in new localities provides inspiring learning experiences. The TANDEM scheme feeds into a variety of objectives – from facilitating creative innovation to nurturing local cultural change-makers. Our vision is to see creative networks emerge from this programme. We are confident that TANDEM networks will continue beyond the year-long collaboration and thus contribute to the social and cultural well-being in their region.